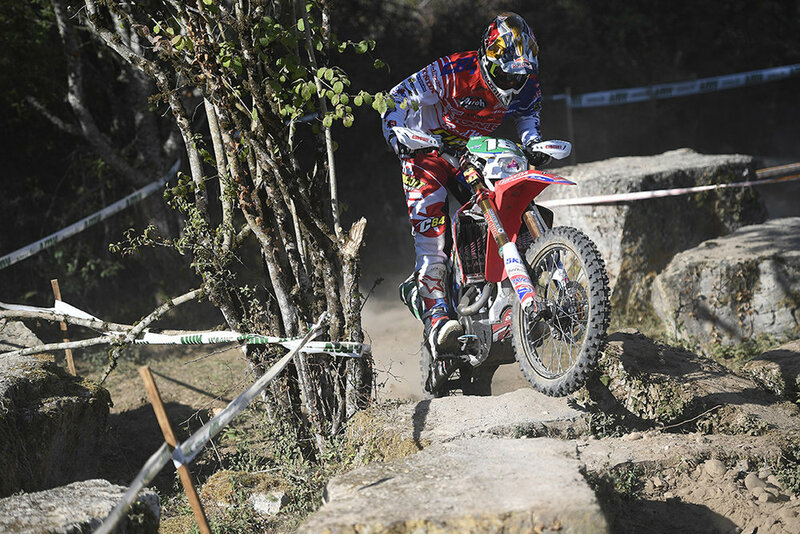 After finishing runner-up in the FIM Junior Enduro World Championship for the past three seasons, Giacomo Redondi (Honda) finally romped to the title in 2016 with a completely dominant campaign that saw him take victory in all but the final race of the season. After back-to-back doubles in Morocco, Portugal, Greece, Finland, Sweden and Euskadi, the 23-year-old Redondi wrapped up the championship in the first race of the penultimate meeting, an emotional home round at Fabriano, Italy, where his thirteenth consecutive race win took his advantage over Sweden's Albin Elowson (Husqvarna) to an insurmountable seventy points. 'Red' looked certain to deliver an unprecedented 100% season when he took the win on the first day of the final round at Cahors, France, but a shock victory for Josep Garcia (Husqvarna) by just six seconds on day two denied him the honour and put the shine on a positive campaign for the Spanish teenager, who had already taken ten podiums, including six second places. The 21-year-old Elowson was consistent all season, finishing every race and putting together a midseason run of five second places to offer something of a resistance to Redondi and hold off the emerging challenge of Garcia for the runner-up spot.